Kathron Sturrock, piano, Richard Edgar Wilson, tenor, Yvonne Howard, mezzo-soprano, with members of the Fibonacci Sequence. 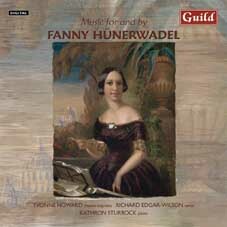 Songs for soprano and for tenor, solo piano pieces, music for solo flute, for violin and piano, and for ensemble - all these made up the 'calling card' of the young composer Fanny H?nerwadel, herself an accomplished pianist. Instead of collecting autographs she collected compositions by friends and mentors, who included Liszt and Wagner. The book is kept in her home town near Z?rich, and Richard Edgar Wilson and I, while presenting a concert of her works, were absolutely bowled over to see in manuscript the pieces we had all recorded. To order any of these CDs please email Kathron Sturrock: kathron@me.com with your name and address.